The best fantasy series ever written is still up for grabs. As I take today to catch up on a metric buttload of thank you letters to patrons and general e-mails that need responding to, try to make some progress in Skyrim so that the article I started over a year ago can get its next part, and generally attempt to continue taking this week a little easier on blogging front than my normal prodigious pulse pounding pace (which perhaps is pretentious but predates perfidious pretending and self-promotion to be a producer of penning without positively providing prose), please take a moment–if you haven't already–to vote in our second semifinal to see which four titles will go on to the final round to be forever immortalized. Forever until the next time I run this poll, of course. Also don't forget the Polldaddy quirk that allows everyone to vote once each week. 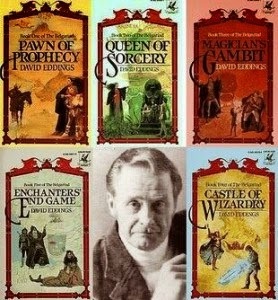 You may yet produce the deluge of sheer dogged tenacity that allows David Eddings Belgariad series to be more than a nifty picture on the right side of this post.